I’m pretty happy most days. Alongside a life filled with beautiful interiors, products, blogging, trends and craft, I have an added focus on health. For those who don’t know, I have been in and out of hospital more times than I can remember, since the age of thirteen I’ve suffered from a condition called Hydrocephalus. This is a where excess fluid collects around the brain. To manage the condition I have a shunt (like a valve) to help drain the excess fluid away. Unfortunately shunts can fail and other complications can occur. So far I’ve had four brain surgeries, three probes in the brain and numerous tests. Lately I’ve been quite ill which means there’s probably more to come. We all have our own issues, some worse than others and these are just the cards I’ve been dealt. 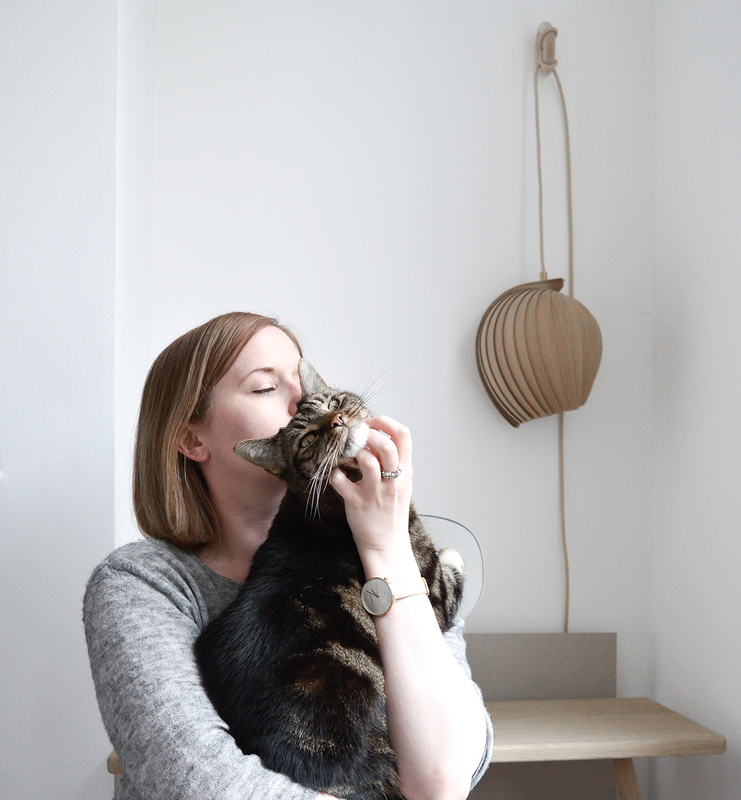 So why am I writing this on my (mainly) interiors blog? I believe that well designed products and interiors can improve our lives, health and happiness. Only recently I have rearranged my bedroom and painted it with Fired Earth’s Pier Point, a soothing light taupe pictured below. Now the space is calm and relaxing. a perfect sanctuary when I’m feeling unwell. There’s much to be said for the influence of ergonomics, colour theory, use of space etc. As an interior designer I know too well how improving a space can change the client’s life for the better. How we use a space can dramatically change our mood, happiness and way of living. I think we all should look at our own homes and ask ourselves, “What does this space say about me?” and “How can I change my home to suit my lifestyle?”. Keep your living space clutter free. Unnecessary mess can cause anxiety and stress. Introduce a colour coding system. I’ve colour coded my books, it’s not the most practical way of organising but it looks brilliant and makes me so happy when ever I look at my bookcase. Burn a scented candle. I’m a sucker for a posh scented candle, I really love honeysuckle and narcissus from Oliver Bonas and Petit Grain 21 from Le Labo collection at Liberty London. Lounge in style. I’m guilty for not always wearing particularly nice clothes when lounging at home, however I feel great when I wear a nice, comfortable yet stylish top. It can really boost your mood. Nothing beats a good breton, I’ve found that Toast and Boden do great quality bretons. Cuddle up with some stylish cushions and blankets. I LOVE my Donna Wilson rainy day blanket perfect for when I’m really under the weather (pun intended!). Decorate with fresh flowers. Flowers completely change the look and feel of the room. Blogger Holly Becker has released this great book Decorate with Flowers: Creative ideas for flowers and containers around the home . Open the windows, fresh air and light soothes the soul. My reading list for a happier, healthier and creative life. It’s all good, delicious and easy recipes that will make you look and feel great, by Gwyneth Paltrow. This book is so beautiful, not only do the recipes look amazing but the styling and photography is to be admired. Bright Bazaar, Embracing colour for make-you-smile style by Will Taylor. A very successful blogger who embraces and celebrates the world of colour. His positive attitude and zest for life is quite infectious, this book delivers tips on decorating with colour and injecting personality. So no matter what happens, stay happy, be inspired, creative and smile! Lovely post Hannah, your attitude is very inspiring; I want to paint my house now!